PGIMS Rohtak Senior Resident Recruitment 2018 Notification will avail on 14th June 2018. Apply Through Online @ The Online Link valid till on 19th June 2018. Check the PGIMS Rohtak Sr Resident Recruitment Online form to send before the Deadline of the Application. The Date of Interview for the Sr Resident & Demonstrator Posts will be on 21st June 2018. PGIMS Rohtak Sr Resident Recruitment 2018: The most effective job updates site again got the good update from the PGIMS Rohtak college.There is a recruitment from PGIMS Rohtak for the posts of Senior Resident & Demonstrator posts.The total number of vacancies of the present recruitment is PGIMS Rohtak. The recruitment board has concluded to appoint well-deserved candidates in the 151 vacant positions of Senior Resident & Demonstrator.This recruitment notification is released with the name of “PGIMS Rohtak Recruitment 2018″.The contenders of this recruitment have to apply in the form of sending CV with all the necessary documents. Apply for PGIMS Senior Resident Jobs 2018: The full name of PGIMS is Pandit Bhagwat Dayal Sharma Post Graduate Institute of Medical Sciences. In short, it is popularly called as PGIMS, Rohtak is one of the good medical colleges in the state of Haryana. The steps needed Apply 151 Sr Resident & Demonstrator Posts @pgimsrohtak.nic.in is simply posting your Application showing all your details like educational background, years of experience in it. The downloaded notification is available on this current page. Check clearly regarding the post in our site @ Recruitmentindia.in. The complete qualifications for PGIMS Rohtak Sr Resident Recruitment 2018 notification as per the job wise. Sr Resident: Should have MBBS from any Institution/University recognized by the MCI MD/MS in the subject concerned. Demonstrator: Must have the Qualification MBBS from any institution/university recognized by the MCI. PGIMS Rohtak Notification 2018: The separate application is not there in this recruitment.You have to make your own perfect resume which shows you are eligible for these vacancies.Before making the resume, get clarity over it by seeing the PGIMS Rohtak Sr Resident Recruitment Notification.Finally, you have to make your resume must be so good so that the recruitment board instantly after seeing your resume will think to call for the interview. Fill the Form before 19th June 2018. The Selection Process is purely based on The Interview performance. So, Show your Talent in the Interview Round. PGIMS Rohtak Senior Residents Jobs 2018: Sample resumes are kept in the official site of PGIMS, Rohtak. Check them once for reference and proceed on your own.You have to be very thorough with the content you have mentioned in the resume.In an interview, some questions will be there from your details you have entered in a resume.So think before keeping the details in your resume.All the best.The Application was already in the commenced mode which is started on 14th June 2018. 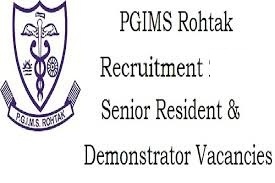 Go on with the Below links to summit the PGIMS Rohtak Online Applications for the Senior Resident & The Demonstrator Jobs. After completion then, Move to submit the Form before the termination of the Applications.